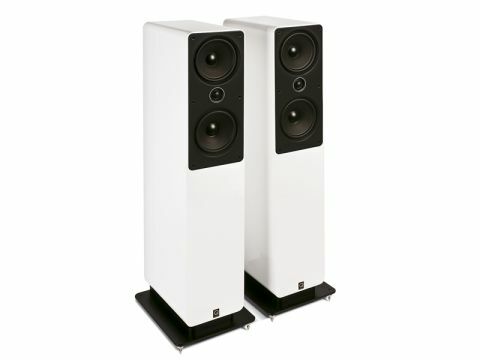 Q Acoustics loudspeakers have a great reputation for their accuracy of timing, imaging and, given their size, dynamic prowess. An attribute we recognised here in the pages of Hi-Fi Choice with a Best Buy badge and an Awards Finalist citation for its previous model, the 1020i. Cue the 2050. With its twin woofers and cabinets that stand over one metre high, the 2050s appear to have what it takes to add even more muscle to the Q Acoustic family. Whilst their price pits them against plenty of rivals, few offer so many cubic centimetres per pounds sterling. Those that do are, inevitably, sonically compromised. The 2050's mission, therefore, is to maintain the enthusiastic sound of their little brothers, but with an added dose of wallop. The 2050 is typical of its breed with a few additional design flourishes. The paper pulp woofers and soft dome tweeter are the very model of convention. Double magnets on the woofers make them magnetically shielded and thus safe to use around magnetically stored data. Given the price, the cabinet is also extremely well constructed. No fewer than four braces, including individual woofer braces make for low cabinet resonance. The curved cabinet edges not only look smart, but are designed to reduce cabinet diffraction for improved stereo imaging. It's also good to see extensive damping. Both faceplate-to-cabinet and woofer to brace interfaces are damped by copious amounts of black plastic padding. The conventional crossover features bi-wirable and gold-plated binding posts. These are hidden at the base of the speaker and do much to enhance the clean lines, especially when pulled away from a rear wall. Should you be forced to place the speakers close to a wall, however, then foam port-dampers are supplied to control the bass. Our glossy white samples looked great but do, along with gloss black, set you back an additional £80 (black/walnut are £370 per pair). Look beyond the glossy finish and the 2050 is well made, if hardly sensational. Some of the (hidden) machining around the woofers is roughly finished and, at around 23mm, the MDF cabinet is not the thickest. The thin, pressed steel woofer baskets don't exactly exude quality and the internal speaker cable is nothing to write home about, either. The grilles are also rather flimsy. Having said all that, against its class competitors, the 2050s are solid and do have elements of fine finish. The gloss paint on our test speakers was flawless and, thanks to the bracing, the cabinet is very rigid. The curved cabinet edges and smoothly designed plinth help further, but we can't help but feel that it's only skin-deep beauty. If the finish is excellent in places and average in others, much the same can be said of the sound quality. Immediately apparent is the impressive sound stage. As good as many speakers costing twice the price, the 2050 locks vocals dead-centre and gives the band or orchestra room to stretch out. Better still, the staging has three dimensions with both depth and projection. Other positives include fine dynamic scale and a taut bass that doesn't sacrifice too much agility for weight and extension. Less impressive is the tweeter's performance. An indistinct percussion and lack of treble precision lets the side down. Also, the timing isn't as enthusiastic as the smaller Q models and certainly not a patch on the best standmounts at this price. The 2050 has the scale and weight of sound that's missing from Q Acoustics smaller models. There can also be no doubting the exceptional sound-staging and separation. Sadly, it's the detail aspects of sound quality that hold the 2050 back from excellence. The treble performance is too rough around the edges, with average definition. Similarly, while they look the part, the big Q Acoustics aren't as well finished beneath the surface as they could be. A good speaker, then, but not a great one.